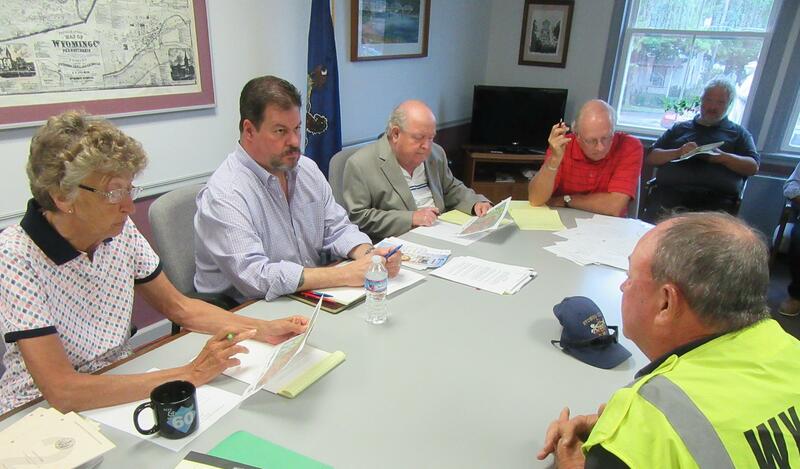 Wyoming County EMA Director Gene Dziak (right) shows the commissioners a map of the area hit hardest by last night’s storms during their regular public meeting held Tuesday morning. 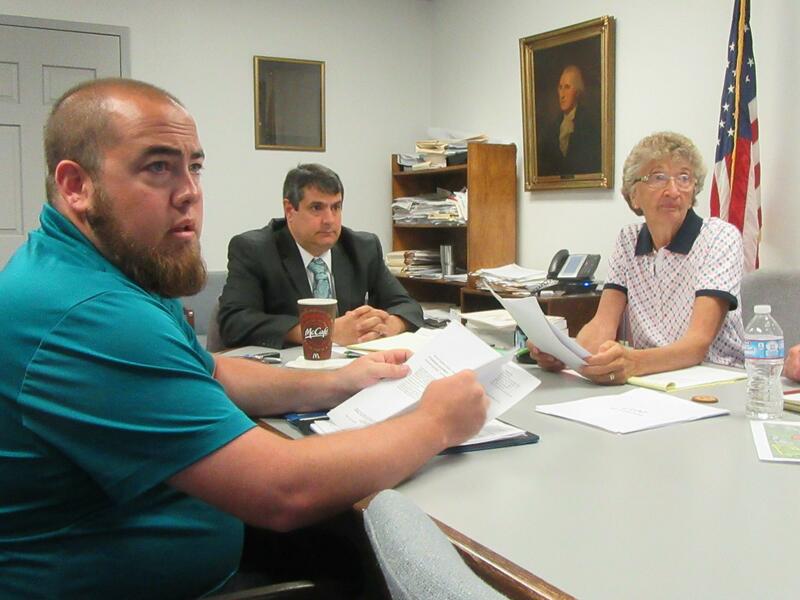 A severe wind storm in the northeast corner of Wyoming County and response by county agencies were the first matters of business addressed at the bi-weekly meeting of the commissioners on July 25. EMA director Gene Dziak was between tasks when he stopped by the courthouse in Tunkhannock to report on the situation. “It was a pretty serious event, but nobody was injured,” said Dziak, who was about to return to Factoryville to prepare a formal damage assessment for the state. Nonetheless, he continued, there are still numerous trees and power lines down in the area, which extends to Fleetville in adjacent Lackawanna County. Initially, more than a thousand residents lost electricity, prompting the EMA and American Red Cross to open Lackawanna Trail High School as a temporary shelter. Only one family with children sought assistance and did not stay. The shelter was closed at 2 am when power came back on. 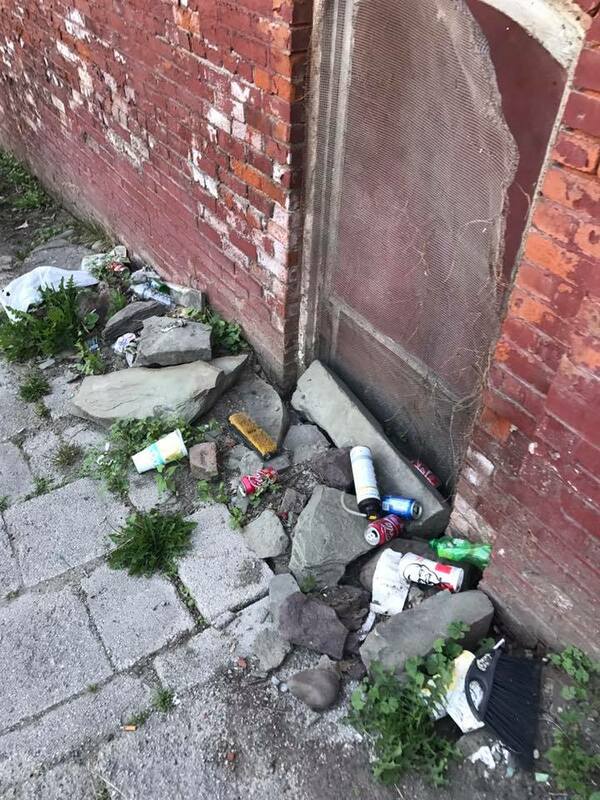 With only a relatively small portion of Wyoming County suffering extensive damage, Dziak noted that county services have been offered to Lackawanna County as needed. Services across the region have been stretched thin over the past few days, with parts of Bradford and Susquehanna counties badly damaged by storms over two consecutive evenings. 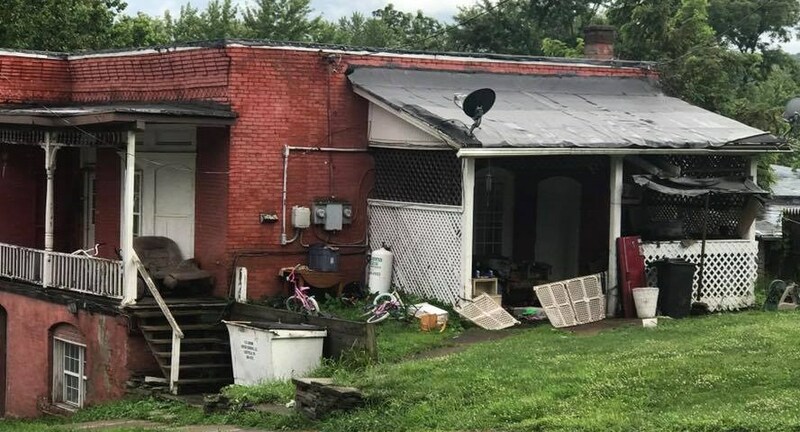 The poor condition of numerous structures in the borough of Meshoppen was brought to the attention of the commissioners by Ross Cameron (above), who is a life-long county resident but relatively new to the borough. “I want to be part of the solution, not the problem,” he stated, as he showed several photos (shown here) to the board. Cameron was particularly concerned about a multi-use building at the intersection of Canal and Auburn streets. The building is collapsing and full of mold, he contends, and he is concerned for the health of an elderly couple living in an apartment in the building, as well as children who play on streets below. The people living in the building told Cameron that they stopped paying building owner Steve Colley rent months ago due to the condition of the structure. The commissioners asked Cameron if he’d spoken with borough officials about his concerns. While he had yet to attend a borough council meeting, Cameron responded, he had spoken to a person who identified himself as the borough’s codes enforcer. “He told me there were no codes,” said Cameron. County solicitor Atty. Paul Litwin III indicated that every municipality in the county has adopted the Uniform Construction Code, which specifically addresses “unsafe” buildings. Section 403.84 defines an “unsafe building, structure or equipment” and dictates that “A building code official may determine that a building…is unsafe because of inadequate means of egress, inadequate light and ventilation, fire hazard, other dangers to human life or the public welfare, illegal or improper occupancy or inadequate maintenance” all of which seem to apply to the Colley building. 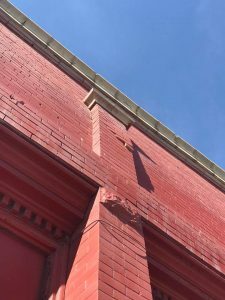 Cameron made it clear that the Colley building is not the only unsafe building in town, but he feels that borough officials do not seem concerned about the problem. Cameron came to the commissioners, he noted, to increase public awareness. Commissioner Ron Williams added that Meshoppen is not the only municipality dealing with dilapidated structures. 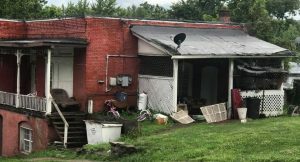 Commissioner Tom Henry said that he drove past some of the buildings in question after Cameron contacted him and agrees that their condition is deplorable. Commissioner Judy Mead pointed out that she grew up in Meshoppen and is dismayed by the condition of the structures cited by Cameron. Litwin also noted that Meshoppen is among a number of municipalities that contract with Bureau Veritas, a company that specializes in building code inspections, and that borough officials could ask them to come in and inspect the buildings in question. There have been a rash of new phone scams in the county recently, and the primary target seems to be unsuspecting rural elderly residents. Commissioner Mead shared a letter from the APPRISE office of Luzerne County Area Agency on Aging about a Wyoming County woman who had agreed to a “house call” by a supposed Medicare agent to discuss her benefits. Fortunately, the woman’s son arrived shortly after a man who identified himself as Barry Phelps did. The meeting ended abruptly, but not before the son got photos of the perpetrator’s silver Jeep Liberty and NY license plate HEX 5816. Authorities confirmed that the Jeep was registered to a Barry R. Felton of Johnson City, NY, and that the phone number he had used to contact the woman rings at a computer parts store. APPRISE associates have contacted Medicare to report the issue and caution all residents that Medicare does not schedule house calls. Anybody with additional information about Barry (Phelton) Phelps are encouraged to contact PSP at Tunkhannock 570-836-2141. Readers with questions about potential fraud may contact APPRISE at 570-822-1158 x 2309. 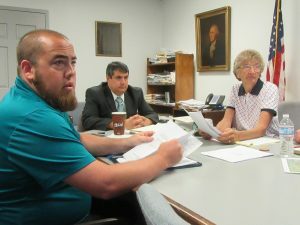 The commissioners approved and signed the annual union contract for the Wyoming County Prison, noting few changes beyond the number of pay periods during which insurance payments would be collected and a compromise on a request for clothing reimbursement. Employees had ask for $300, Commissioner Henry explained, but the county negotiated the amount to $200 as an allowance rather than a payment by check. Prison employees can order from a list of approved items from Kransom Uniform. Mead added that employees received new, high-quality uniforms this year. In other prison-related news, Henry related that he’d received a call from a representative of Pennsylvania Correctional Industries, who would like to meet with the county to demonstrate ideas for prisoners to produce items from wood. With the 175th anniversary of the Wyoming County Courthouse on tap, Henry suggested that inmates could make commemorative gifts for the celebration. He said that he would entertain a meeting with the company representative as a way to address overcrowding at the prison and the fact that many prisoners leave the facility without skills to obtain gainful employment. County 911 director Jeff Porter (above, left) came to the commissioners meeting with specs on a new Chevy Suburban that he hopes can be up-fitted with the appropriate technology to serve the county as a new mobile command center. The Exel warehouse fire in January pushed emergency systems to the limit and revealed deficiencies that a new vehicle could overcome, including the ability to track equipment and personnel. At $42,371, the purchase could actually save the county about $14,000. A portion of that savings – $12,000 – would be realized through the PA COSTARS purchasing program, and another $2,000 because the 2018 version of the Suburban is less expensive than the 2017 model that was previously under consideration. Nonetheless, the commissioners were unsure of where the money would come from, though Act 13 funds are the most likely source, as they can clearly be used for public safety. The upgrades, which would include an on-board repeater to help emergency responders using radio equipment in areas or structures that limit transmission, can probably be paid for from the 911 budget. The first estimate Porter received was $25,000, which he felt was extremely high. He told the commissioners he thought he could get the job done for less than $20,000. 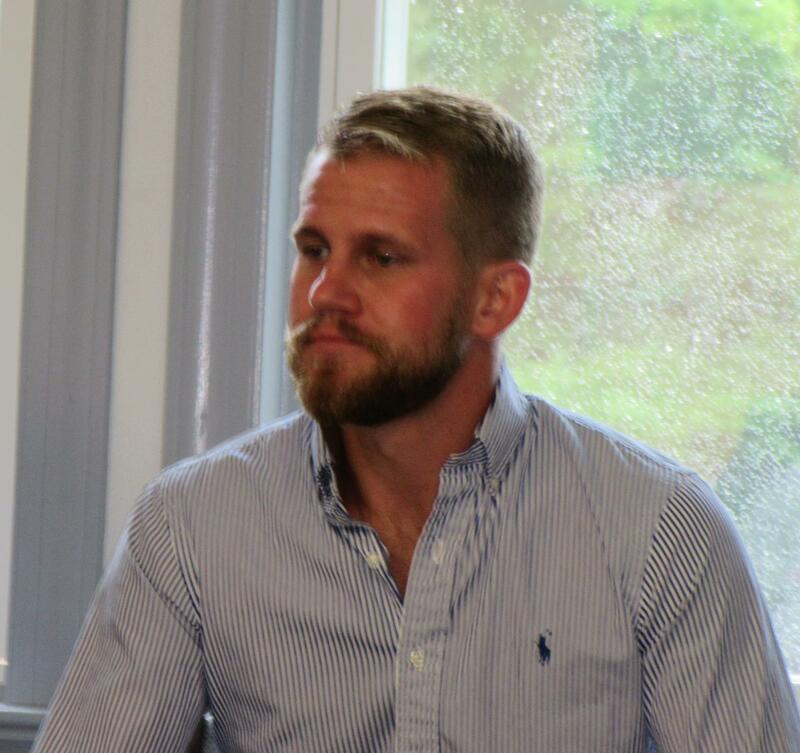 “We’re hoping that, not only will it be able to be beneficial to the county, but also to other municipalities,” Porter explained. Commissioner Mead agreed that the bus that is currently used as a command center cannot be driven to remote locations, such as natural gas sites. Commissioner Henry suggested that community and corporate support could help ease the burden of county spending on the vehicle, discussion of which was tabled in lieu of immediate availability of funds.